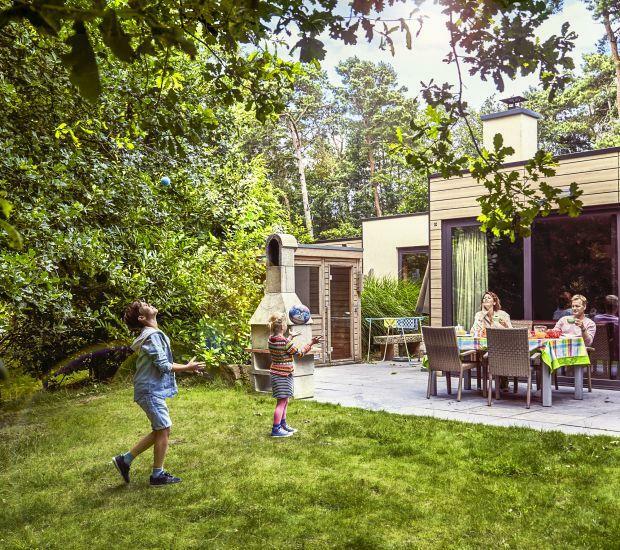 When you think about child-friendly holiday parks, it’s Center Parcs. You will always experience something new in the subtropical swimming paradise and with all the activities. Make new memories together and say yes to what really matters! Being together. Don't forget to enjoy our family- and/or early booking discounts. It can't get any better. You will be staying in a cottage where you have everything you need, and surrounded by nature, with enough space to play. A cottage with all the trimmings: a fully equipped kitchen, bathroom, terrace for a BBQ and a private garden to play some football. Spot animals together on your terrace, like squirrels, rabbits and even some deer! Book an adventurous cottage, like a Boat house or a Tree house. Or a Jungle Cabana; staying over in the Jungle Dome after hours! A New generation Children's Cottage will definitely surprise the kids, with a playroom and a private playground. Book a Pony Holiday: a cottage at the riding area and 'your own' pony to take care of. Enjoy long evenings of family fun with the Family Game Package. Kids want to use their creativity and energy during a holiday. Center Parcs is the perfect place to bring their fantasies alive. Hours of fun in the Aqua Mundo with slides, wild water rapids, extra hot water in the Children’s pool, family changing rooms, swimming vests and less chlorine. Bye-bye red eyes! Enjoy children's entertainment by Orry & Friends, like the brand new show, Kids Disco and Kids Parade. And of course, with free entertainment during the evening. BALUBA indoor play paradise, with soft playground equipment and themed play worlds such as the tropical Jungle Dome and pirates world Discovery Bay. With our Wannabe activities program, children live out their dreams of becoming a real Pirate, Princess, Fireman, Ranger or a Knight for a while! Children will have a lots of fun during a trip in their own jeep on Kids Safari or even being a captain on their own ship in the Kids Harbour. Go out for dinner with the family and you have everything you need: children's menus, playground equipment, themed restaurants. True enjoyment! When your kids get older, they want to do cool things. Challenges enough to see how far they dare to go at Center Parcs! Watch them glow with pride – and so will you too. Endlessly playing around in subtropical swimming paradise Aqua Mundo with slides, a wave pool, snorkel pools and the only real wild water rapid. Push yourself to the limits with the Cool Factor activities: jumping from a tower, climbing and paintball. Puzzles, questions and challenging tasks raise the excitement in the Escape Rooms. Will you escape together in time? Feel the adrenaline rush on the High Adventure Experience climbing trail, or zip across the lake with the super exciting Zip Wire. Race down the wild water rapids at top speed with wild water rafting. Thrills and spills guaranteed! Do you want some me-time? Let yourself be pampered in the spa or book a VIP cottage with its own private sauna.